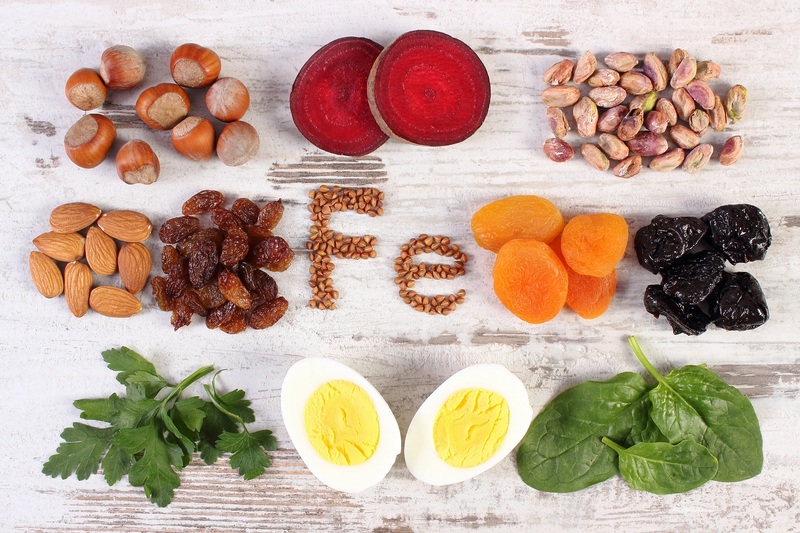 We at Beyond Nutrition can help you avoid Iron Deficiency & Stay Healthy! IRON DEFICIENCY is a common problem all around the world. Iron plays a very important role in the body as it helps transport oxygen through our blood. Iron is also used to make hemoglobin which is a part of the red blood cells. When there is a deficiency in iron, it means that your body will be making less and smaller red blood cells. In the United Arab Emirates there are many different cultures and nationalities and therefore iron deficiency is also a common problem that we see. Iron deficiency affects both men and women however women have been shown to be at an increased risk. Women of child-bearing age have an increased risk due to heavy menstrual periods and bleeding that they may experience. Women are also more likely than men to follow very restrictive or low calorie diets which can increase the risk for iron deficiency as they are often not consuming adequate iron rich food sources. When women are pregnant or breastfeeding this further increases their risk for iron deficiency because there is a much increased blood volume which in effect requires that more iron is used for oxygen transport to the baby, leading to possible iron deficiency. So what causes iron deficiency? There are various causes of iron deficiency among individuals. One of the causes is a lack of intake of iron rich food sources. Another cause of iron deficiency is blood loss. An inability to absorb iron is another cause of iron deficiency – iron absorption takes place in the small intestine and when there is damage in the small intestine, lack of iron absorption can lead to a deficiency. 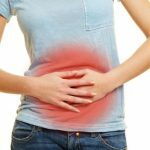 This often occurs in individuals that have celiac disease because they experience damage to their intestinal lining. How do we know that we have a deficiency in iron? Well, the symptoms are many. 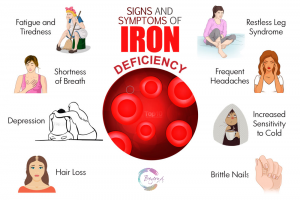 If you experience tiredness and fatigue, or have pale skin, increased heart rate, weakness, dizziness, hair loss or headaches it could intake a possible iron deficiency. If you suspect you may have iron deficiency it is a good idea to speak to your doctor regarding your medical history and symptoms. A blood test is also advised to see what your red blood cell levels are as well as an iron test that will determine how much iron is in the blood. From a nutrition perspective, there are many ways that we can combat iron deficiency. Eating a diet rich in iron will boost blood iron levels. 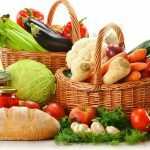 These foods include meat, fish, tofu, iron-fortified cereals, eggs, pulses, beans, dried fruit (e.g. apricots and prunes), and dark green leafy vegetables. It is also important to increase your iron absorption by including vitamin C rich foods at the same meal as your iron rich meals. Vitamin C is found in tomatoes, peppers, broccoli, peas and green leafy vegetables to name a few. Some factors have been shown to decrease absorption of iron. These include calcium found in dairy products as well as polyphenols found in teas and coffee. It is best not to have these at the same time as iron-rich meals. Place the lentils in a pot with the water and bring to a boil. Cover and simmer for 30-35 minutes, until the lentils are tender but still retain their shape. Drain any excess water from the lentils and set them aside. Heat the olive oil in a large skillet over a medium-high heat. Add the shallots and cook until they are softened, about 3 minutes. Add the spinach and cook until just wilted, about 2 minutes. Add the tomatoes, lentils, basil, parsley, and mint to the pan and stir to combine. Cook until warmed through, about 1 minute. Stir in the lemon juice, salt and pepper and serve. Heat the oil over medium heat in a large cast iron pot. Add shallots and carrots and cook until the carrots have started to soften, about 3 – 4 minutes. Add mushrooms and continue to cook until mushrooms are tender, another 5 minutes. Add garlic, red pepper flakes and herbs. Stir the mixture until it becomes fragrant, about 1 minute. Pour in lentils, broth and 2 cups of water. Bring the mixture to a boil, cover and reduce to simmer for 15 minutes. Remove lid and add quinoa and remaining water. Stir to combine. Bring the mixture back to a boil, recover and reduce to simmer for another 15 minutes. Remove the pot from the heat, uncover and add spinach, stirring gently to combine. Season with salt and pepper. Add the garlic and thyme and cook for a further 2 minutes. Add the celery, carrots and sweet potatoes, stir, then add in the chicken broth and water, salt and pepper. Bring to the boil, then simmer for 20 minutes. Add the shredded chicken and heat through for 2-3 minutes, then add the kale. Stir and simmer for 1-2 minutes until the kale has wilted. Season with more salt and pepper if needed. Divide between four bowls, topped with fresh parsley and a couple of sprigs of fresh thyme. Want to know more? Make an Appointment with one of our Nutritionists or Dietitians!